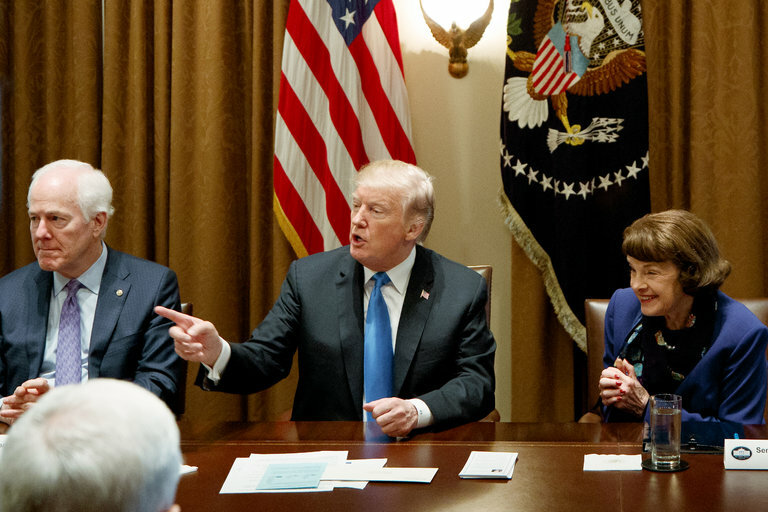 President Trump appeared to embrace comprehensive gun control during a meeting with lawmakers on Wednesday at the White House. WASHINGTON — President Trump on Wednesday repeatedly embraced a series of gun control measures, telling a group of lawmakers at the White House to pursue bills that have been opposed for years by the vast majority of the Republican Party and the National Rifle Association. In a remarkable televised meeting in the Cabinet Room, the president appeared to stun giddy Democrats and stone-faced Republicans by calling for comprehensive gun control that would expand background checks, keep guns from the mentally ill, secure schools and restrict gun sales from some young adults. To the surprise of many in the room, Mr. Trump urged the bipartisan lawmakers to start with a bipartisan bill put forward in 2013 by Senators Joe Manchin III of West Virginia, a Democrat, and Patrick J. Toomey of Pennsylvania, a Republican. That bill died months after the mass shooting at Sandy Hook Elementary School in Newtown, Conn., after intense Republican opposition. Mr. Trump repeatedly suggested that the dynamics had changed, in part because of his leadership in the White House, a sentiment that the Democrats in the room readily agreed with as they saw the president supporting their ideas.